It is not necessary to introduce the Royal Oak which for close to 50 years has been shaking up the haute horlogerie market with the introduction of many premieres. Not only was it the very first luxury sports watch when launched in 1972, it was also the very first luxury sports watch featuring a complication. In 1982, exactly 10 years after its launch, the Royal Oak was presented with a perpetual calendar, not only a rare complication at the time, as very few brands were still producing them, but the audacity of housing this delicate complication in a steel sports watch was mind boggling. In 2017 Audemars Piguet once again took the world by surprise by presenting the perpetual calendar Royal Oak in full ceramic livery. This was not the first time ceramic was used in watchmaking and even Audemars Piguet had used it in certain components, such as bezels. However, it was the first time a high horology watch brand was housing a sports watch in a full ceramic case and bracelet (a material that Vacheron Constantin and Patek Philippe do not use for the Overseas or Nautilus respectively). Ceramic is an almost scratch proof material but very difficult to use. 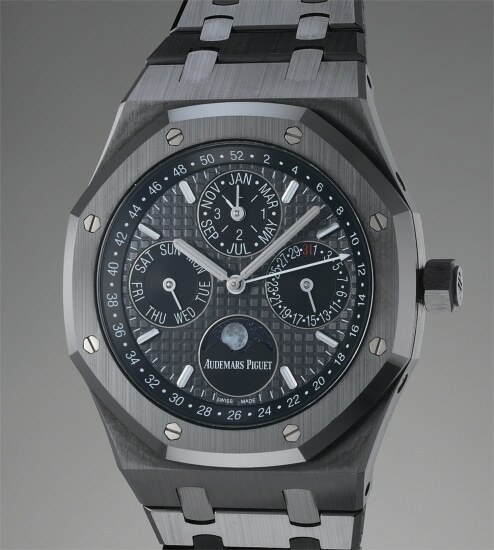 According to Audemars Piguet, over 600 hours of research were necessary to develop the case and bracelet, and where is takes about six hours to machine, polish, hand-finish, and assemble a steel bracelet for a steel Royal Oak, the same procedure requests over thirty hours for the ceramic version. The dashing dark looks of the watch should not deter from its elegance and technical complexity. The slender case houses the automatic caliber 5134 based on the iconic calibre 2120 as found in the original 1972 Royal Oak. Other than the traditional calendar functions, the present Royal Oak has a 52 week indicator as well as a gorgeous moonphase display with a photorealistic moon on an aventurine background for the stars. One of the hottest watches on the market, to obtain the Royal Oak Perpetual Calendar in ceramic requests patience as the waiting list can stretch to a few years. The present example in excellent condition and complete with winding box and papers offers the collectors a superb opportunity to immediately obtain such a beautiful and hard to find timepiece.